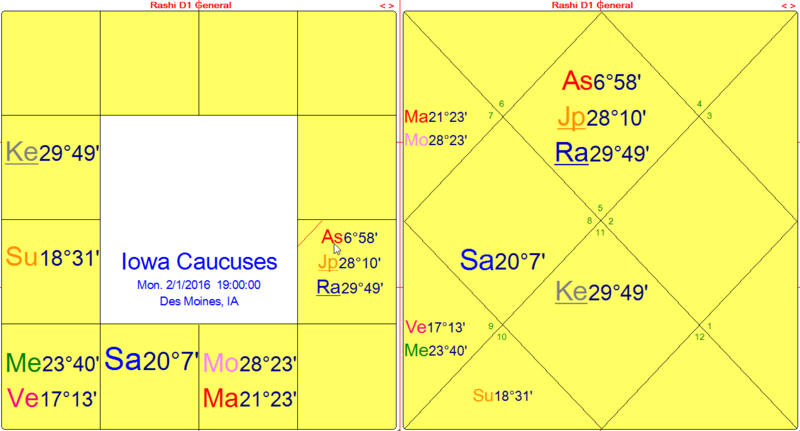 There are FOUR MAJOR PLANETARY SIGNATURES just three weeks prior to the Iowa caucuses on Feb 1, 2016. This event, in turn, launches the four-month long primary season to decide the presidential nominees for the two major U.S. political parties. These planetary markers indicate what is to come shortly in the more critical portion of the early presidential campaign period. In fact they are already showing their influence as of early January 2016. Tr. Jupiter turns Stationary Retrograde at 29:09 Leo : Thurs. Jan. 7, 2016, 23:28 EST, Washington, D.C.
Rahu-Ketu (True node) enters Leo-Aquarius : Fri. Jan. 8, 2016, 23:55 EST, Washington, D.C.
New Moon 25:08 Sagittarius : Sat. Jan. 9, 2016, 20:31 EST, Washington, D.C.
Rahu-Ketu (Mean node) enters Leo-Aquarius : Fri. Jan. 29, 2016, 15:22 EST, Washington, D.C.
Rahu and Ketu are the north and south lunar nodes. They retrograde backwards in the zodiac, and can be measured in two ways: by Mean node and by True node. Thus, it is important to consider both in terms of their timing. The True nodes usually change signs some three weeks earlier than the Mean nodes. Rahu and Ketu represent change and the unexpected, and in Vedic mythology they are known by the mystical symbol of the serpent. A full nodal cycle lasts 18 years, in which Rahu and Ketu shift signs backwards in the zodiac every 18 months. Since eclipses usually occur in the signs where they are transiting, the nodes have an enormous impact on certain areas of life while they are in those signs and houses in the astrological chart, both for individuals and the collective. Leo and Aquarius are fixed signs, and as a fire sign representing the Kshatriya (warrior) class, Leo also includes political leaders. Leo is the most royal of the three fire signs. Ruled by the Sun, Leo expresses leadership on so many levels that when Rahu (the foreigner, or the exotic one) enters the sign for 18 months, there may be sudden changes in royalty of various kinds, including political royalty; also, in how we view leadership, as whatever may have been unacceptable or quixotic in some way in the past is coming into prominence and finding greater acceptance. Rahu and Ketu signify not only the foreigner but the outcast. By contrast, Jupiter is more traditional and conventional. So when Rahu conjoins Jupiter in an area of the zodiac related to both leadership and royalty, this indicates a changing of the guard that upsets previously held concepts, including by journalists (also Jupiter), especially establishment journalists. We see this in various ways, with the new importance of burgeoning social media in election politics, and with Donald Trump’s defiance of Fox News in the last week of Jan. 2016. Roger Ailes and Rupert Murdoch founded Fox News (i.e. GOP news) in Oct. 1996, and up until now it has ruled over Republican politics with an iron hand, including over the George W. Bush presidency, 2001-2009. Tr. Jupiter remains in Leo through Aug. 12, 2016, conjoining Rahu in Leo for seven months. This covers the many U.S. presidential primary races from Feb. 1 to June 14, 2016 as well as the Republican and Democratic Party conventions, July 18-21 and July 25-28, 2016, respectively. A person whose birth chart contains Jupiter-Rahu together in one sign is someone for whom religious orthodoxy is a challenge, something they tend to rebel against. This is the influence of Rahu and Ketu (the stranger, the foreigner, the exotic one) on Jupiter, who represents the conventional aspects of religion. We can extend this to the collective and bring in more significations of Jupiter: the nation-state, law and lawyers, religion and its leaders, higher education and teachers, journalists and journalism, and the publishing industry. Since the Sun rules over leaders and leadership, as mentioned earlier, and Rahu is the foreigner or the exotic one, more and more light and attention is going to those competitors for leadership (i.e. presidential candidates, in this context) who are challenging the status quo. Since Rahu and Ketu always move in retrograde motion, their entry into Leo-Aquarius is at 29:59 of the signs. With Rahu at 29:59 Leo very close to where tr. Jupiter turned Stationary Retrograde at 29:09 Leo one day earlier, this means tr. Jupiter and Rahu will be closely conjoined in late Leo for over two months, from Jan. 8 to March 7, 2016 (using measurements for both True Node and Mean node), and in the same sign until tr. Jupiter exits Leo Aug. 12, 2016. All these factors serve to emphasize the themes of upsetting, confronting and testing the status quo. When the lunar nodes enter the Leo-Aquarius axis for 18 months, there is a major shift especially in the fortunes of royalty and ruling monarchs, or those whose inherited status equals political royalty. Among the current presidential candidates this would apply to Hillary Clinton and Jeb Bush. From Jan. 8, 2016, tr. Jupiter in Leo is now aspected or contacted by three classical malefic planets (Saturn, Rahu and Ketu). Thus, from early Jan. 2016 Jupiter is subject to new influences that can cause upset by blockage or separations of some kind (Saturn) and by foreign or unexpected forces at play (Rahu and Ketu). On the Republican side, Ted Cruz and Donald Trump are considered extremists by some, but their strong leads over other more establishment candidates make it clear how much outrage exists in the country over issues of extreme inequality. There is a “rigged system” favoring the top .01%, who in turn have wealth equaling that of the bottom 90% of the population. Democratic candidate Bernie Sanders has also been labeled an extremist for espousing “democratic socialism” and for proposing “a political revolution” to tackle the enormous financial inequities that have evolved globally, but remarkably so in the United States. The 2016 U.S. Presidential Election campaign has already shown a strong populist trend that cuts across ideological boundaries. Since both Trump and Sanders each have a strong populist message, it has brought them the largest and most enthusiastic crowds on the campaign trail since early summer 2015. On the Right, Trump blames immigrants, President Obama, government entitlement programs, and THE OTHER. On the Left, Sanders blames a rigged political system favoring Wall Street bankers over the average citizen, outsourcing jobs, avoiding taxes and paying “dark money” to fix election results and thereby ongoing government policies. Sanders also cites the disastrous decision to invade Iraq in 2003, while Trump seeks to expand the military. Trump’s version of this could be called “Authoritarian Populism” – as opposed to the “Reformist Populism” of Bernie Sanders. (Without naming anyone, economist Robert Reich presents these terms among others in his interview Oct. 24, 2015 at the Wisconsin Book Festival, Madison, Wisconsin.) Authoritarian Populism, according to Reich, uses fear as a device to control, and tends to find numerous scapegoats, all of which can presumably be improved or fixed by a strong, authoritarian figure. The potential for Authoritarian Populism to descend into demagoguery is very real. Reformist Populism aims to reform the institutions and laws that have gotten out of control and no longer serve the people. Instead they serve only a very small group of privileged individuals and corporations. As anti-establishment candidates from the Right and the Left, both Trump and Sanders are the only ones broadly perceived by the public as able to end crony capitalism and corporate welfare, such as the Wall Street bailout. Sanders has made this a major focus of his presidential campaign, while Trump has not yet said very much about Wall Street reform. Clinton has moved further to the Left during the 2015-2016 campaign, but while she touts her experience and pragmatism, her weakness remains being so richly funded by Wall Street institutions while claiming she will enact effective and pragmatic banking reforms. Also, she is promising to be a close continuation of the Obama administration, which, in addition to her political royal family status, rules her out as an “upset” candidate. Given that the Jupiter-Saturn square chart (May 26, 2016) indicates the prominence of an “upset” candidate, this reflects the political climate in which establishment candidates such as Hillary Clinton and Jeb Bush find themselves struggling to keep their presumed frontrunner status, Bush obviously far more than Clinton as of summer 2015. Even so, both of them are by far the more well-funded candidates from Super PACs and “dark money.” Ted Cruz also receives large funds from Super PACS, as we will see presently from some statistics on the subject. With former New York City Mayor Michael Bloomberg starting to float the idea that he may soon launch his own presidential candidacy as an Independent, all the leading candidates would be either billionaires (Trump and Bloomberg), or richly funded by billionaires (Clinton and Cruz) – all except Bernie Sanders. Though Trump appears to be the biggest upset candidate in terms of breaking all previous standards of media coverage and stardom, Sanders is the only true upset candidate in terms of the “political revolution” he proposes in order to clean up the corrupt and non-functioning political system that has evolved in the U.S. SOURCE: http://www.uspresidentialelectionnews.com/2016-presidential-primary-schedule-calendar/ Election Central 2016. The Iowa Caucuses are held this year on Mon. Feb. 1, 2016, 7:00 pm CST, Des Moines, Iowa. (The state capitol is used here, but caucuses are held all over Iowa.) The Ascendant is Leo up to 20:58 CST, or for the first two hours of the Caucuses, when most of the decision-making is done and votes are cast and confirmed. This chart uses Mean node, with Rahu-Ketu having just entered sidereal Leo-Aquarius Jan. 29, 2016. The Iowa Caucuses occur three days later. (True node on Feb. 1, 2016 for this chart is 28:29 Leo-Aquarius, or 19 minutes of arc from tr. Jupiter.) The Ascendant is 6:58 Leo, closely conjoining Donald Trump’s Ascendant at 6:55 Leo and giving him some continued authority on this occasion as the ongoing Republican frontrunner among the crowded field of Republican candidates, though challenged more recently by Ted Cruz. Tr. 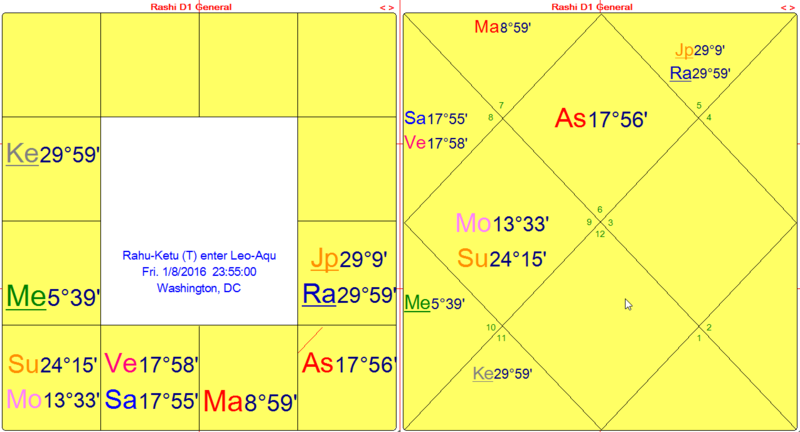 Jupiter is at 28:10 Leo, while Rahu at 29:49 Leo is close to the Jupiter Stationary Retrograde degree (29:09 Leo) and to Bernie Sanders’ natal Rahu at 29:52 Leo. His Rahu return is very close to the Jupiter SR degree. Further, Rahu is also his Dasha lord, and this should all be very auspicious for Sanders, amplified by his current Rahu-Venus Dasha (March 16, 2015 to March 15, 2018). Clinton, meanwhile, has tr. Moon (28:23 Libra) close to her birth Ascendant at 27:50 Libra, and her natal Moon (29:40 Aquarius) in opposition to tr. Jupiter (28:10 Leo) and Rahu (29:49 Leo). While tr. Moon on her natal Ascendant (with tr. Mars) is mostly positive, tr. Jupiter’s opposition to her natal Moon (10th lord) is not favorable, since for Libra Ascendant, Jupiter rules the 6th house of conflict. Jan. 04, 2016: Podcast on the 2016 U.S. Presidential Election. Some points in the Dec. 21, 2015 article above are reviewed. Further, due to several planetary events in early January (Jan. 7, 8 and 9, 2016), there are sudden shifting fortunes for royalty – including political royalty – who could feel the disruptive and weakening effects to their plans sooner than forecast in the May 2016 JU-SA square chart. This applies to Hillary Clinton and Jeb Bush. Trump’s status as a billionaire places him firmly within the plutocracy, but if he is royalty, it is in the sense of the self-appointed heir apparent. Even so, like Sanders, he is considered the anti-establishment candidate, at least up to now. Rahu (the foreigner) conjoining Jupiter in Leo favors the non-royal, non-establishment candidate. It also upsets the status quo in Jupiter’s realms, which include the nation-state, law, religion, education, journalists and journalism. Major media is allied with the oligarchy and the political party establishments, and it is challenged in 2016 in the way it reports on this election cycle. http://www.blogtalkradio.com/asabove-sobelow/2016/01/04/astrologer-edith-hathaway-discusses-2016-presidential-campaign (35 min. podcast) Note the slight technical glitch: 25 seconds of silence on the mp3, from 3:16 to 3:41. From May 1, 2015 I had predicted Hillary Clinton could be far more vulnerable as of Feb. 20, 2016 due to several factors, including the condition of tr. Mars in Scorpio in her birth chart (Feb. 20 – June 17; July 12-Sept. 17, 2016). But this vulnerability in her campaign occurred even sooner, and this makes sense when you consider two other factors: 1) the effects of Clinton’s Campaign launch chart, indicating her first serious problems in the presidential campaign as of Dec. 26, 2015; and 2) the effects of Rahu-Ketu entering Leo-Aquarius on Jan. 8, 2016, as described earlier, when her status as political royalty begins to be disrupted. Previously, in mid-October 2015 she was riding high due to multiple factors working in her favor, including her 11-hour testimony before a Senate Investigating Committee on Benghazi. Intended to humiliate her and bring her down, it did the opposite. Other global events up through early December tended to favor her greater experience in foreign affairs. But by mid-December 2015, she had slipped a bit in the polls, though still considered the overwhelming favorite as Democratic frontrunner, a position she maintained since announcing her candidacy April 12, 2015, even if far larger crowds were attending Sanders’ events starting in summer 2015. Then soon after the Christmas holidays and by early January 2016 a notable slide began for Clinton in the polls against her Democratic rival Bernie Sanders. She was suddenly in trouble due to Sanders’ rising numbers in the polls – both nationally and in the early primary voting states: Iowa and New Hampshire. In a New York Times piece Jan. 5, 2016 Sanders pointed out the $675,000 Hillary Clinton earned for three speeches she gave to Goldman Sachs in 2015. Together the Clintons were paid over $25 million for 104 speeches delivered since Jan. 2014. Fortune magazine, among others, has been quick to defend Clinton, saying that such payments are not linked to government policy decisions. But the fact remains that Big Money spends increasingly huge sums to buy influence in policy decisions protecting their status tax-wise and trade-wise. Senator Sanders’ campaign has focused on these themes; and on Jan. 26, 2016 he announced he would block Obama’s nominee to head the Food and Drug Administration due to his ties to the pharmaceutical industry and lack of commitment to lowering drug prices. Corporate media continues to play an important role in the 2016 Election – not only how Donald Trump has outfoxed and defied Fox News, but how corporate media has virtually ignored Sanders throughout 2015, despite his having large, enthusiastic crowds from early in summer 2015, those numbers often rivaling or exceeding the Republican frontrunner, Donald Trump. Then suddenly, as of early Jan. 2016, not even mainstream media could ignore Sanders, as he was fast becoming a serious rival to Clinton. Her attack teams started to come out strongly, including daughter Chelsea Clinton, though her debut as Clinton spokesperson was flawed due to the many factual errors she presented. Both sides have become more vigorous and intense in opposition to each other; and though Sanders has adhered to his lifelong standard of no personal attacks, by Jan. he did start to go after Clinton’s close ties to Wall Street, as discussed. As we approach the pivotal Iowa Caucuses, many of the planetary indicators from early Jan. 2016 have made their presence known. From these indicators it seems clear that the two anti-establishment candidates, Trump and Sanders have a definite edge and an excellent chance to win Iowa as well as some key early states. Ted Cruz has battled strongly in Iowa, aided immensely by funding from four billionaires who view him as a conservative challenger and an “outsider” at a time when they think such a candidate is ripe to win. Though he aims to get many votes from the Christian Evangelical and Tea Party constituents, Cruz is not truly an anti-establishment candidate, especially when funded by those seeking to protect the status quo of Wall Street interests. And in his approach to immigration and voter’s rights, he is closely aligned with many other Republicans seeking to restrict voting rights and to implement states having their own voting laws. Cruz fought vigorously for the current law in Texas that allows a handgun permit as an acceptable ID for voters, but not a student ID. Though it would be helpful if we could validate the accuracy of Cruz’s birth chart, even using a 12 noon chart, it is unlikely that he or any other Republican candidate could match the power of Donald Trump’s chart. That is why I have said from Dec. 2015 onward that Trump will probably be the Republican nominee. As for Hillary Clinton, it could be that her more pivotal losses do not occur until Feb. 20, 2016 (the Nevada caucuses) and onward, when tr. Mars in Scorpio joins the other negative factors for her. But since Clinton has run into trouble right on schedule, according to both her Campaign Launch chart and the larger planetary cycles, i.e. in particular Rahu-Ketu entering Leo-Aquarius on Jan. 8, 2016 – this indicates that her weakness vis-à-vis Bernie Sanders can and has occurred sooner than Feb. 20, 2016, when tr. Mars in Scorpio leaves her vulnerable for six months, with one break. This podcast runs 35 min. Please note there are 25 seconds of silence on the mp3 (from 3:16 to 3:41) due to a technical glitch experienced by the NYC host.